I was just reading a contrived Kotaku article that had similar sentiments, but ended up much farther off from the point. Nothing to make the argument stick if you will. Here this video does make a better point about the violence not feeling as necessary as the first Bioshock. And its true. There isn’t as much of a connection for the combat and vigors in Infinite as there was for the combat and plasmids to the story in the original. Plasmids were a crucial part of the first game, and was the whole origin of the splicers. Is it a negative? Yes, certainly. But the issue is that not only is it a pindrop in the grand scheme of things when talking about Infinite, it also is something that does exist and these commenters are acting as if it doesn’t at all. While there isn’t as STRONG of a moral-driven reason to be killing these mobs, there still is one in Infinite that neither of these people seem to bring up. Comstock’s army in Infinite is a deluded, racist, cult. They just aren’t hopped up on drugs and wearing masks. They look much more normal and real. Which makes it feel wrong. But you might as well be fighting Nazis here. The game makes it very clear that they are extremists and it gets worse by the day. So its culminating TO what happens in Bioshock 1 like what happened with Andrew Ryan. It just hasn’t happened yet. The game makes this CRYSTAL clear. I don’t quite understand how this guy and the Kotaku girl miss such a critical scene in the game towards the end. No where in her article does she mention the fact that the game’s enemies become essentially unstoppable super-terrorists! Do you ~need~ more of a moral reasoning here? Why does she and the video’s author insist that the combat feels out of place in a game like this? In other words, why does the player have to wait for tragedy to happen BEFORE being justified in their actions and to make them matter? Its such a cliche that I’m glad that the game plays the way it does. Also, since when has this been an issue for games? For years we’ve had games about killing plenty of people, aliens, and animals in all different kinds of scenarios. Sure, some are most certainly more justified and can be a much better experience because of it. But Infinite does a fantastic job of justifying its own violence and the more I read people agreeing with these critics, the more I feel that they’re not just comparing Bioshock Infinite to Bioshock 1 anymore. Rather, they’re making blanket statements about the game. Regardless, I suppose, at least the video’s author makes much better points than the repost on Kotaku. I agree the violence doesn’t feel as emotional and doesn’t tie into the story as STRONGLY as the original does. But after the ending, you kind of get this feeling – at least I did and I can see a lot of others do too – that the game is meant to play on the irony of the player of a video game and their obedience to the game’s design. 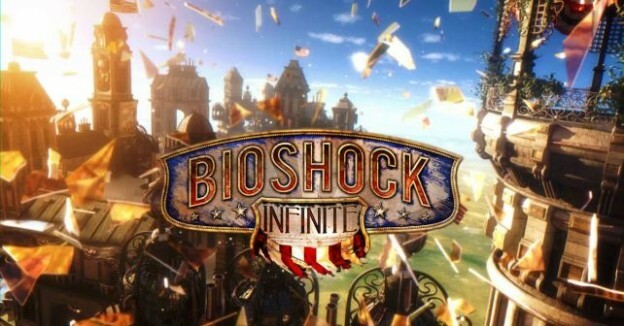 Even the original Bioshock 1’s story both figuratively and literally too! The game’s final culminating scene that completely justifies the story, combat, and everything in between might just be the last 20 minutes of the game, but its something that is layered in the entire game from the second it starts till it ends in that last scene(s). The player just does not know. To try and make a point about the combat and other parts of Infinite being too much of a “gamey” kind of video game rather than the kind of game Bioshock 1 was is the ~point~ of the theme(s). If you don’t really understand what I’m getting at, or just don’t quite understand the ending of Bioshock Infinite like many others don’t, then I highly recommend this excellent analysis from Eurogamer. 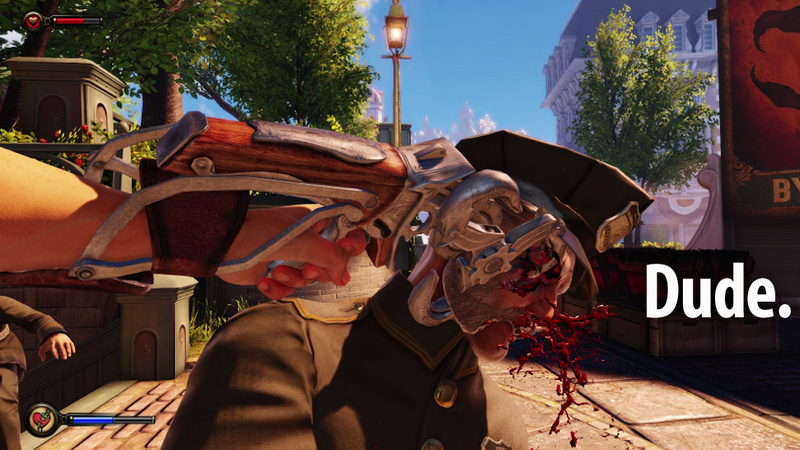 Bioshock Infinite is not a perfect game by any means. But it is one of the more finer ones you can find out there. If you must reminiscent over the lack of Big Daddy encounters rather than appreciate the bigger theme and the higher-octane combat that Irrational decided to go for, then I believe one is trying too hard to compare two rather distinct games rather than enjoying both of them for what they really are.